The Fall is an apocalyptic work, addressing what the world might be like if pollution and neglect to the environment continues. In the building, videos from La Jetée, Chernobyl Diaries, and The Road play in the windows. 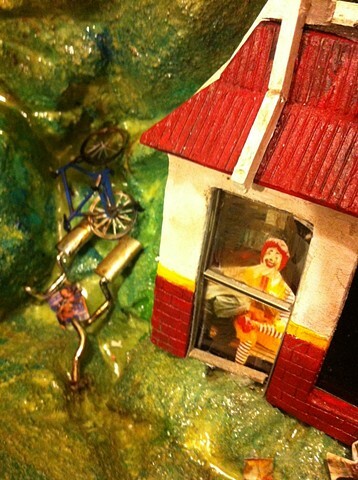 In the underwater McDonald's, the video plays scenes of the BP oil disaster, pigs dumped in a Chinese Shanghai river, fracking issues with tap water catching on fire, George Bush Jr. speaking of the "advancements" he made for the environment, part of a trailer from the "Toxic Avenger", scenes of Chernobyl, the Japan tsunami, Tom Sach's Mcdonald's sculpture, McDonald's pink slime for mcnuggets, the red toxic Yangtze river in China, scenes from The Day After film (1983), newscast about radiation in Iraq. The inside of the lake is painted with glow in the dark paint. There is a switch on the back bottom part of the sculpture that switches the main lake lights off. The front painted graffiti on the lake bottom part are graffiti images found in Chernobyl. The copied and pasted graffiti on the bottom are from images I took in Jaffa, an Arab town in Israel.